"Glacial" redirects here. For the science fiction short story, see Glacial (short story). Look up glaciation in Wiktionary, the free dictionary. 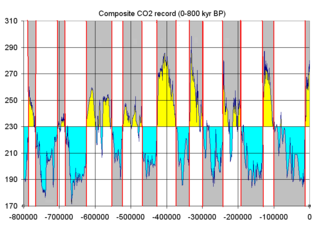 Glacial and interglacial cycles as represented by atmospheric CO2, measured from ice core samples going back 800,000 years. The stage names are part of the North American and the European Alpine subdivisions. The correlation between both subdivisions is tentative. Within the Quaternary (about 2.6 Ma to present), there have been a number of glacials and interglacials. The last glacial period was the most recent glacial period within the Quaternary Ice Age, occurring in the Pleistocene epoch, which began about 110,000 years ago and ended about 15,000 years ago. The glaciations that occurred during this glacial period covered many areas of the Northern Hemisphere and have different names, depending on their geographic distributions: Wisconsin (in North America), Devensian (in Great Britain), Midlandian (in Ireland), Würm (in the Alps), Weichsel (in northern central Europe), Dali (in East China), Beiye (in North China), Taibai (in Shaanxi) Luojishan (in Southwest Sichuan), Zagunao (in Northwest Sichuan), Tianchi (in Tianshan Mountains) Qomolangma (in Himalaya), and Llanquihue (in Chile). The glacial advance reached its maximum extent about 18,000 BP. In Europe, the ice sheet reached Northern Germany. In the last 650,000 years, there were, on average, seven cycles of glacial advance and retreat. Since orbital variations are predictable, computer models that relate orbital variations to climate can predict future climate possibilities. Work by Berger and Loutre suggests that the current warm climate may last another 50,000 years. The amount of heat trapping gases emitted into Earth's Oceans and atmosphere will prevent the next glacial period (ice age), which otherwise would begin in around 1,000 years, and likely more glacial cycles. ^ a b J. Severinghaus; E. Brook (1999). "Abrupt Climate Change at the End of the Last Glacial Period Inferred from Trapped Air in Polar Ice". Science. 286 (5441): 930–4. doi:10.1126/science.286.5441.930. PMID 10542141. ^ Bralower, T.J.; Premoli Silva, I.; Malone, M.J. (2006). [Abstract Summary Leg 198 Synthesis : A Remarkable 120-m.y. Record of Climate and Oceanography from Shatsky Rise, Northwest Pacific Ocean] Check |url= value (help). Proceedings of the Ocean drilling program. p. 47. doi:10.2973/odp.proc.ir.198.2002. ISSN 1096-2158. Retrieved April 9, 2014. ^ Christopher M. Fedo; Grant M. Young; H. Wayne Nesbitt (1997). "Paleoclimatic control on the composition of the Paleoproterozoic Serpent Formation, Huronian Supergroup, Canada: a greenhouse to icehouse transition". Precambrian Research. Elsevier. 86 (3–4): 201. Bibcode:1997PreR...86..201F. doi:10.1016/S0301-9268(97)00049-1. ^ Miriam E. Katz; Kenneth G. Miller; James D. Wright; Bridget S. Wade; James V. Browning; Benjamin S. Cramer; Yair Rosenthal (2008). "Stepwise transition from the Eocene greenhouse to the Oligocene icehouse". Nature Geoscience. Nature. 1 (5): 329. Bibcode:2008NatGe...1..329K. doi:10.1038/ngeo179. ^ Cohen, K.M. ; Finney, S.C.; Gibbard, P.L. ; Fan, J.-X. "International Chronostratigraphic Chart 2013" (PDF). stratigraphy.org. ICS. Retrieved 7 January 2019. ^ F. Varadi; B. Runnegar; M. Ghil (2003). "Successive Refinements in Long-Term Integrations of Planetary Orbits" (PDF). The Astrophysical Journal. 592: 620–630. Bibcode:2003ApJ...592..620V. doi:10.1086/375560. Archived from the original (PDF) on 2007-11-28. ^ Berger A, Loutre MF (2002). "Climate: An exceptionally long interglacial ahead?". Science. 297 (5585): 1287–8. doi:10.1126/science.1076120. PMID 12193773.